The Amish Single Pedestal North Glenn High Dining Table with Solid Top offers the perfect spot for sitting for breakfast, sharing drinks with friends and enjoying a quiet evening cup of coffee. 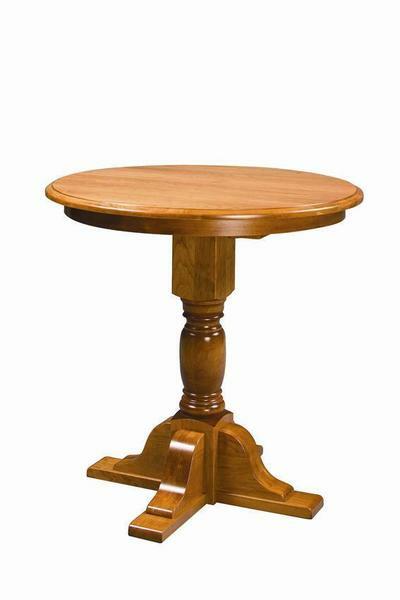 A stunning pedestal base is featured for this table with turnings and woodworking that show the true skill of our Amish woodworkers. Added height means the Single Pedestal North Glenn High Dining Table makes the room look a little bigger. Pub height is comfortable for taller folks and hosts casual dining and gathering with ease. The North Glenn High Dining Table is handcrafted in the custom choices you like best. Order online or get in touch today for assistance with customizations. Thanks for shopping with us.